Cruises are a good way to explore the world superficially. A few hours on dry land is only long enough to sniff the atmosphere. When my friend Jenny and I took a Caribbean cruise in 2011 my priority at our first port of call, Fort de France on the French island of Martinique, was to buy a pair of jeans, having omitted to pack any informal trousers. My French is limited. I now know that you should ask for le jean. Les jeans is apparently permissible, but you may get more than you bargained for. Once that mission was accomplished Jenny and I wandered around Fort de France and drank mojito at Le Foyaal (now apparently closed): https://www.tripadvisor.co.uk/Restaurant_Review-g147328-d1567683-Reviews-Le_Foyaal-Fort_de_France_Arrondissement_of_Fort_de_France_Martinique.html. I intended to follow the cruise spirit and simply idle away my days in tropical luxury, but my history antennae twitched when we passed the Cathedrale de Saint-Louis (1895), which looked for all the world like a British Commissioners’ Church but in Roman-Byzantine style, tricked out in tan and brown decoration with a tower and spire 186 feet high. The building was being renovated, so we couldn’t go inside. I simply photographed the exterior and looked it up later. In fact, it’s an interesting and significant building, the seventh on the site since 1657. The sixth church was destroyed in the great fire of Fort de France on June 22nd 1890, and a temporary repair-job was swept away by a cyclone the following year. After this latest in a succession of natural disasters, the Archdiocese resolved to build an iron-framed structure that would resist hurricanes, storms and earthquakes. The design of St Louis’ Cathedral is by Pierre-Henri Picq (1833-1911), who had worked alongside the ubiquitous Gustav Eiffel (1832-1923) in France. Picq built the Palais du Chili [Chile Pavilion] for the 1889 Paris Exposition Universelle for which Eiffel’s great tower was the landmark. Both men used their knowledge of iron construction to construct public buildings abroad. Eiffel, for instance, is responsible for the General Post Office (1886-1891) in Saigon, Vietnam. Judging by photographs, the interior of Picq’s St Louis’ Cathedral [https://en.wikipedia.org/wiki/St._Louis_Cathedral,_Fort-de-France#/media/File:Cath%C3%A9drale_de_Fort_de_France_-_Int%C3%A9rieur.jpg], is glorious – light, colourful and unmistakably iron rather than masonry. Despite its iron construction, an earthquake in 1953 destabilised the tower so that the spire had to be dismantled. A replacement spire was installed in a restoration programme of 1976-9. Since the cathedral was designated a historic monument in 1990, successive restoration programmes have taken place. Picq also designed the Bibliothèque Schœlcher [Schœlcher Library] (1893), commemorating Victor Schœlcher (1804-1893), the French abolitionist writer and Martinique politician. The Library is recognisably by the same hand, in an eclectic Byzantine style, making use of an iron frame, glass, tiles and mosaic. Another of Picq’s buildings in Fort de France is the Magasin du Printemps (1901). You don’t see much of a place when you arrive on a cruise ship. The way to know anywhere is to stay there, and in most places there are interesting buildings to look out for. If I ever find my way back to Martinique, I now know what else there is to see. This entry was posted in Christmas in a T-shirt, Life-enhancing experiences, Sacred Places, Victorian Architecture on December 24, 2016 by Mike Higginbottom. It took me three attempts to spend Christmas in Florida. The first time there were no flights and I ended up in Jordan. The second time that Florida was full I stayed at home and bought myself a television. Eventually, in 1999, I hired a car in Miami and drove down the Keys. The name “Key” derives from the Spanish “cayo”, meaning “small island”. The road-journey on US Highway 1 down the Florida Keys is unique. In some places it’s a dreary highway bristling with motels, but for most of the time you drive between the sea and the mangrove swamps. The highway is mostly built on the trackbed of the Florida Overseas Railroad, the inspiration of one man, Henry Morrison Flagler (1830-1913), one of the original partners, along with John D Rockefeller, in the great Standard Oil enterprise. After Henry Flagler had taken his first wife to St Augustine, Florida, for her health in 1878 he pulled back from active involvement in the oil industry and started a second entrepreneurial career extending his Florida East Coast Railway southwards from St Augustine to develop what became Palm Beach, Fort Lauderdale and Miami. In the following years Henry Flagler took the decision to extend his Florida East Coast Railway 128 miles all the way across the archipelago south of Biscayne to Key West, then the largest town in Florida with a population of 20,000. The string of islands that curves from south-west to west for over seventy miles presented huge engineering challenges. The seaways between the islands were spanned mostly by closed-spandrel concrete viaducts like the 2.15-mile Long Key Viaduct which consists of 186 35-foot arches carrying the track 31 feet above the sea. The longest of all these crossings was the Seven Mile Bridge, which curves across the small island of Pigeon Key and is in fact four successive viaducts. The northern three sections, Knights Key, Pigeon Key and Moser Channel bridges, consist of steel spans laid directly on concrete piers; the southernmost section, the Pacet Channel Viaduct, has 210 53-foot closed-spandrel concrete arches. The total length including approaches was actually nearer to nine miles. Trains crawled along the single track, completely unfenced, at a limited speed of 15mph, for fear of a derailment. The rationale behind building this prodigious railway, which some at the time dubbed “Flagler’s Folly”, was that Key West was a major coaling station for ships sailing between the New York City and South America, and would be the first and last port in USA territory for ships traversing the Panama Canal, then under construction. 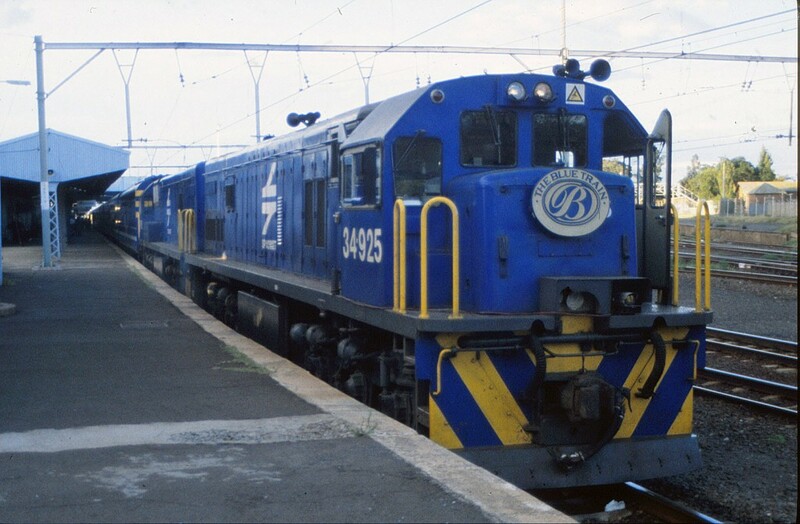 In fact, coaling declined in the twentieth century as vessels increased in range and changed to oil propulsion. The railroad was literally blown away by a hurricane in 1935, but its spectacular viaducts survive: the road now traverses modem concrete viaducts alongside, and the disused railway bridges serve as fishing platforms. This entry was posted in Christmas in a T-shirt, Life-enhancing experiences, Transports of Delight on December 25, 2015 by Mike Higginbottom. In the autumn of 1997, well before I was up to speed with the internet, I tried to book a Christmas holiday in Florida, only to find that Florida was full. After a lifetime of running tours of one kind or another, I like an occasional mystery tour, so I declined to read up on Jordan beforehand. I was entirely content to trust the tour-company, Bales [http://www.balesworldwide.com], and they lived up to their reputation. My Uncle Frank, who’d been to Jordan on his National Service, warned me it’d be cold. I didn’t really appreciate that, though the sun is bright, the December wind across the desert is chilly, and each day I wore the one sweater I’d brought on top of layers of T-shirts. I was particularly glad of my keffiyeh scarf, especially when I realised that while the Egyptians use them as headgear to keep off the desert sands, the Jordanians use them as multi-purpose scarves à la Pavarotti. On Christmas Day we went to Wadi Rum, the desert area which is not only associated with the real T E Lawrence but was a prime location for David Lean’s film Lawrence of Arabia. 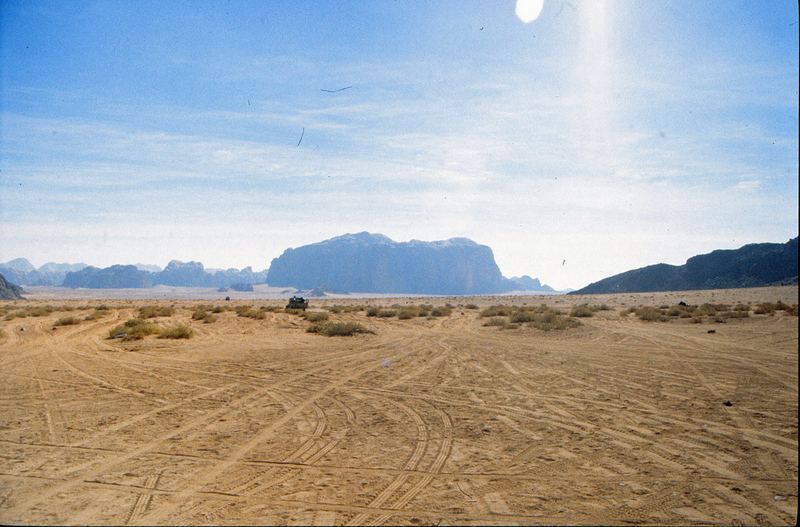 Wadi Rum was magnificent: I could watch the colours changing on the hills and the sand all day and into the night. We drove about in 4×4 open trucks, me wrapped up in my woolly sweater and Yasser-Arafat/Pavarotti gear. The desert air made me ravenous. Three times a day I said to myself I must not eat such insane amounts of food, and at the next opportunity there I was tucking into yet another enormous buffet – salads awash with olive oil, meats cooked in interesting things like yoghurt, astonishing sweets such as Om Ali which is an Arabian bread-and-butter pudding beyond any Briton’s wildest dreams of custard. I seriously feared for my waistline but I found on my return that I hadn’t gained a pound. As I met my familiar friends they declared without exception how well I looked, so I concluded my trousers must have shrunk at the dry-cleaner’s. This entry was posted in Christmas in a T-shirt, Life-enhancing experiences on December 24, 2014 by Mike Higginbottom. 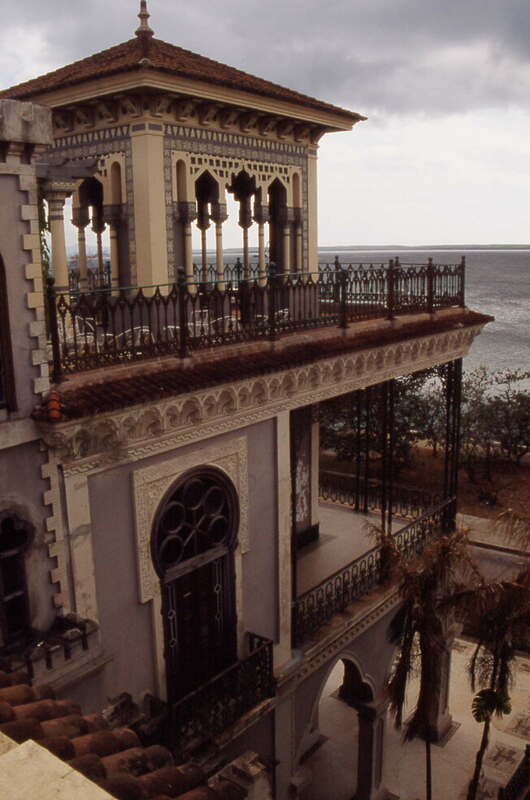 When I spent Christmas in Cuba in 2001, the most eccentric building I visited was the Palacio de Valle in Cienfuegos on the south coast: http://www.cubaheadlines.com/2009/03/14/16253/palacio_de_valle_monument_cienfuegos_cuba.html. Built for a wealthy sugar merchant Oclico or Acisclo del Valle y Blanco as a wedding-gift from his father-in-law, it was designed by an unnamed local architect, possibly Pablo Carbonell Donato, and constructed by Alfredo Colli Fanconetti, an Italian civil engineer. Begun in 1913, it was completed in 1917 at a cost of 1½ million pesos. It’s an astonishing mixture of materials and styles– marble, alabaster, brass, glass and faience. 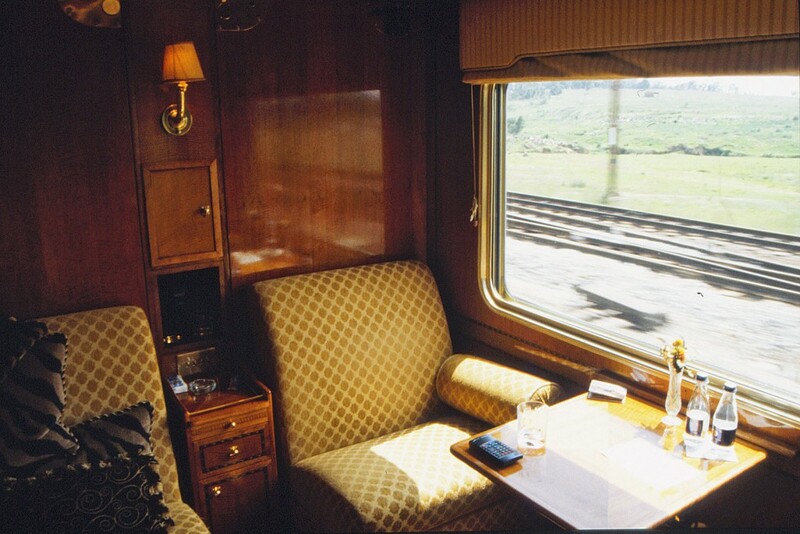 The dining room is in the Mudéjar (Andalucian) style, based on the Patio of the Lions in the Alhambra. The music room is Louis XV. The three rooftop turrets are respectively gothic, Indian and Moorish, respectively symbolising war, love and religion. Del Valle died in 1920, and his widow and children left the place a couple of years later. After passing through a succession of ownerships it was converted by Panchin Batista, brother of the dictator, to a casino in 1950. After the Revolution it became an art school and is now a restaurant. When I visited, some years ago, a lady whom our guide described as a “character” played a grand piano very loudly all through the meal. There’s so much to see and enjoy in Cuba, but in the time I spent there I saw nowhere more memorably unusual than the Palacio de Valle. This entry was posted in Christmas in a T-shirt, Exploring Cuba, Life-enhancing experiences, Victorian Architecture on January 16, 2014 by Mike Higginbottom. For many years, my summer work in England obliged me to holiday abroad – if at all – at Christmas, and I’ve got used to heading off to exotic locations around the winter solstice. The first time I chose Egypt I was so beguiled I went back for a second helping. Egyptology is studied and researched entirely in English, so the local guides are astonishingly fluent, to the extent that on my second tour they invariably addressed our tour-manager, a lady from Essex, as “Na’alie”. Tourist tours to Egypt tend to follow a pattern: in Cairo the Pyramids and the Sphinx, together with the Egyptian Museum, are virtually compulsory. You could hardly not visit them, though not everyone would enjoy the interior of the Great Pyramid, which is rather like Holborn underground with emergency lighting, no ventilation and no escalator. The Sphinx was smaller than I expected, about half the length of St. Paul’s Cathedral, and I was surprised to find it has a tail. When you stand level with its paws you notice it’s gazing straight at a Pizza Hut and a Kentucky Fried Chicken operation. The Egyptian Museum is astonishing, especially if you’ve already seen Tutankhamûn’s modest tomb in the Valley of the Kings at Luxor: the treasure – case after incredible case of thrones and shrines and beds and a chariot and the mask and two equally rich coffins in gold, lapis lazuli and turquoise – fills half a floor of a building the size of the National Gallery. There’s no understanding Ancient Egypt, but it’s possible to gain a sense of wonder. Luxor town made me think of Mabelthorpe with minarets. Here again, there’s a tourist track – Karnak, the Valley of the Kings, the Valley of the Queens, the Temple of Queen Hapshepsut, the Colossi at Memnon and a disconcerting coach-ride to Dendera, which in the 1990s involved an armed convoy of tour-buses high-tailing across the fields and through sleepy villages for an hour: a tourist bus was blown up some years previously, after which the locals’ sales-opportunities became extremely limited. Best of all, though, is the Nile cruise – temples at Esna, Edfu, Kom Ombo and Aswan, the location of the First Cataract. The town of Aswan is dominated by the astonishing Aswan High Dam, Gamal Abdel Nasser’s great legacy, holding back 111 cubic kilometres of water to irrigate the lands downstream and provide up to half of the country’s electricity. The highlight of my Egyptian travels was a before-dawn plane-journey from Aswan to Abu Simbel for the awesome experience of being inside the great temple of Ramesses II at the moment of sunrise. What has always been a great archaeological miracle is now an engineering marvel, for the entire rock-hewn temple was dismantled in 1964-8, moved 200 metres and raised 65 metres away from the rising waters of the Aswan Dam. 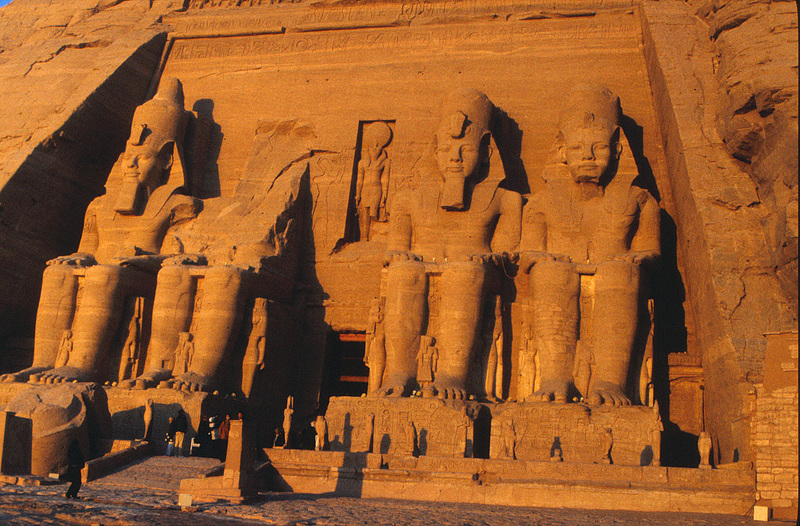 I’ve never before or since paid over £100 for a half-day excursion, and I don’t regret a penny of my early-morning odyssey to Abu Simbel. For the moment Egypt is an uncertain destination for holidaymaking but not completely out of bounds. The warm and friendly Egyptian people continue, in the manner to which they are accustomed, to welcome visitors to their breathtaking land. UK Foreign Office advice about travel to Egypt is at http://www.fco.gov.uk/en/travel-and-living-abroad/travel-advice-by-country/middle-east-north-africa/egypt. This entry was posted in Christmas in a T-shirt, Life-enhancing experiences on January 2, 2014 by Mike Higginbottom.